These visual travelogues will take you to towns and communities throughout western North Carolina over three generations. Follow a route along footpaths and wagon trails as it was in the 1890s, take a train ride in the 1910s, and drive by car along mountain roads in the 1930s to see what the region looked like a century ago. 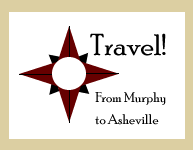 Each stop provides a description of the community, along with the mile markers noting the distance from Murphy and Asheville.